Hypertext links can transfer you to other websites. Guest & Strategy has no control over the contents of these other sites and cannot be held responsible if the contents of these sites contravene current legal and statutory provisions. In accordance with the laws on literary and artistic rights or other similar rights, all the components, trade marks, names, photographs, drawings, models, logos, graphics, colour codes etc. used in the present site are the sole property of the relevant entities within Guest & Strategy, its partners or suppliers, none of which grant any licences or rights other than the right to browse the website. Copying or using any or all of these components is authorised solely for the provision of information for personal and private use. Any copy or use of copies for other purposes is expressly prohibited. Any other use shall constitute a breach of property rights and be penalised under the terms of Intellectual Property unless prior written authorisation has been obtained from Guest & Strategy. 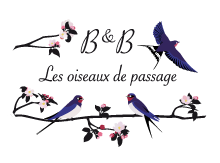 "B&B Les oiseaux de passage"